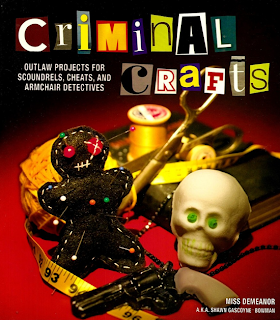 Criminal Crafts : Outlaw Projects for Scoundrels, Cheats and Armchair Detectives by Miss Demeanor AKA Shawn Gascoyne Bowman is one of the most amusing themed craft books I've ever seen. The theme is criminally inspired crafting, and it covers a broad range of crafts. The crafts are clever and most of them are very inexpensive to make as gifts or for your own enjoyment. Each project starts with a brief introduction explaining the inspiration for the project. Some are inspired by real criminals, others are more generally inspired. The projects are all written so craft novices can follow the instructions. The chapters are separated by type according to how it's used. The projects themselves use a variety of techniques including but not limited to paper craft, hand sewing, stamp carving and duct tape. Chapter 1- Criminal Intent has things with practical use, like the John Dillinger inspired gun shaped soap or the wonderful Ransom Note Kit that can be made with minimal cost and would be a great gift for slightly twisted paper crafters. Chapter 2- Accessories to the Fact is accessorizing at it's sneaky, criminal inspired best. I really love the Case the Joint Craft Caddy made from a used violin case and the Crime Scene Tape Messenger Bag. The simple sewn orange and striped fleece poncho named for the craft world's most famous criminal had me laughing out loud. Chapter 3- Recipes for Disaster is cooking and cocktails with a crafty, witty flair. My favorite is the Crime Scene Gingerbread Men all dead in creatively morbid ways. There is also the obligatory cake with a file in it! Chapter 4- Home is Where The Heart is... and the Left Leg and the Spleen is home decor items. I love the noir silhouette Concrete Slippers Window Shade. My daughter loves the Barefoot Bandit Grass-Head Cellmate that's made from a discarded sock. A really fun book with full of great gangster inspired crafts. This is a great book for my teenage daughter and I to work on things together and one I really recommend for sharing craft nights with friends and loved ones. Since most of the crafts can be completed in an evening, they would make a great themed party. Get your favorite gangster film, your glue gun and glue bandolier (instructions in the accessories chapter) and have fun.